A new fossil of an extraordinarily large snake was discovered in the lowland tropics of northern Colombia, 60 miles from the Caribbean coast in Cerrejón. Titanoboa cerrejonensis is part of the genus Titanoboa and these gigantic snakes roamed the Earth during the Paleocene epoch of the Paleogene Period, about 58 to 60 million years ago. Cerrejón is also one of the world’s most important fossil deposits, allowing paleontologists a unique snapshot of the geological moment, right after the Cretaceous-Tertiary extinction event, which brought an end to dinosaurs. It was an immense, swampy jungle, which was wetter, bigger, and hotter than today. The river basin was populated by turtles twice the size of manhole covers, and crocodilians more than a dozen feet long. Titanoboa cerrejonensis was a 40-foot long snake, weighing more than a ton. It looked like a modern-day boa constrictor, but behaved like water-dwelling anacondas. The thickest part of its body would have been as high as a human’s waist. Unlike most of the other Titanoboa fossils, this one included a skull. The reason why they are so rare is that snake skulls are made of delicate bones that aren’t very well fused together. Once the animal dies, the skull falls apart. 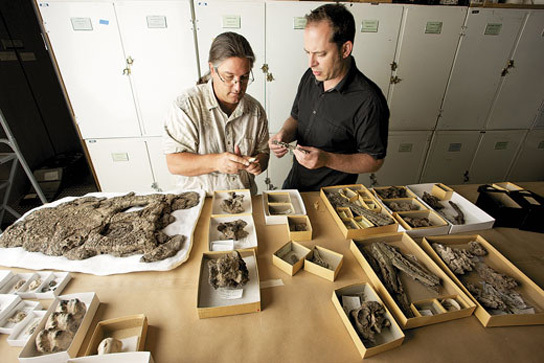 In Gainesville, Jonathan Bloch (left) and Jason Head sort through thousands of fossils from the giant Colombian coal mine. 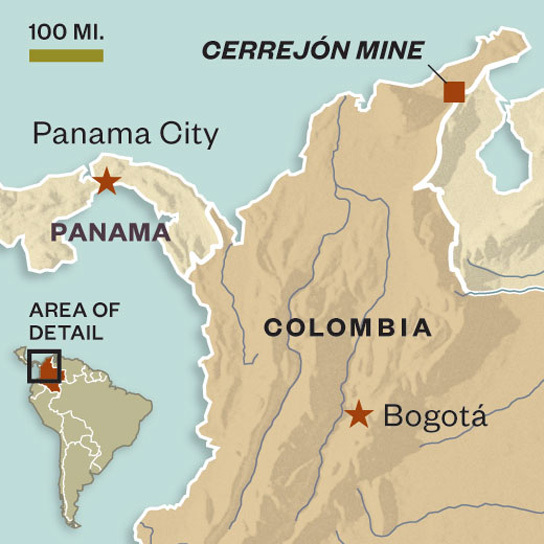 Researchers used mathematical model to initially determine the size of Titanoboa. Its jaw had a quadrate, a hinge bone connecting the lower jaw to the skull, allowing the back of the lower jaw to extend behind Titanoboa‘s brain. Its diet probably consisted of crocodilians, fish, and turtles. Reptiles can grow bigger in warmer climates, allowing coldblooded animals like Titanoboa to maintain the necessary metabolic rate to sustain its bulk. 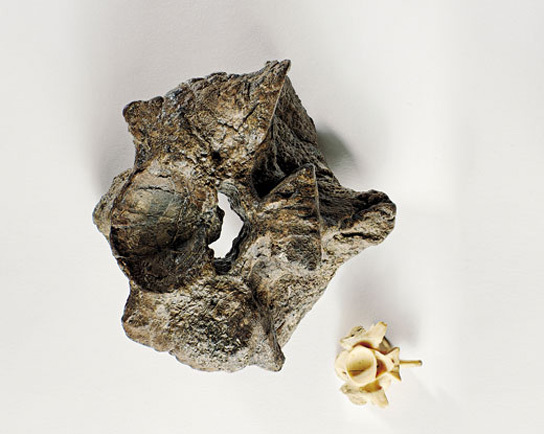 A Titanoboa vertebra dwarfs that of a modern 17-foot anaconda. Be the first to comment on "Titanoboa, a Paleogene Period 40-Foot Long Snake"